Arts and Cultural Heritage Association York and York’s Alternative History, with Heritage Corner, are proud to present MARRIAGE & FREEDOM, a unique programme consisting of two dramatic presentations with extremely rich narratives. Heritage Corner from Leeds explores the significance of African British history towards the understanding of heritage and diversity in Britain today. 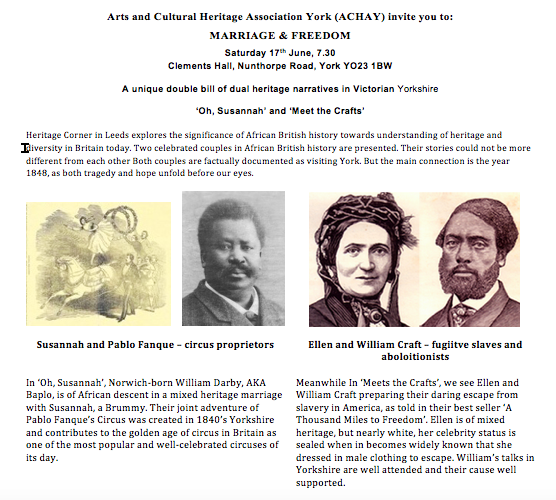 Two celebrated couples in African British history are presented. Their stories could not be more different from each other. Both couples are factually documented as visiting York but the main connection is the year 1848, as both tragedy and hope unfold before our eyes. The first play entitled ‘Oh, Susannah’, features Norwich-born William Darby, AKA Baplo, who is of African descent in a mixed heritage marriage with Susannah, a Brummy. Their joint adventure of Pablo Fanque’s Circus was created in 1840’s Yorkshire and contributes to the golden age of circus in Britain as one of the most popular and well-celebrated circuses of its day. The second play entitled ‘Meets the Crafts’, we see Ellen and William Craft preparing their daring escape from slavery in America, as told in their best seller ‘A Thousand Miles to Freedom’. Ellen is of mixed heritage, but nearly white, her celebrity status is sealed when in becomes widely known that she dressed in male clothing to escape. William’s talks in Yorkshire are well attended and their cause well supported. A unique double bill of dual heritage narratives in Victorian Yorkshire. There will be opportunities for questions, discussion, networking and having a generally great evening out. Seriously not to be missed! This entry was posted in Uncategorized and tagged African British History by helengraham. Bookmark the permalink.